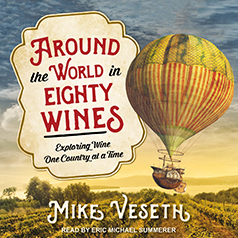 Inspired by Jules Verne's classic adventure tale, Mike Veseth takes listeners "around the world in eighty wines." The journey starts in London, Phileas Fogg's home base, and follows Fogg's itinerary to France and Italy before veering off in search of compelling wine stories in Syria, Georgia, and Lebanon. Every glass of wine tells a story, and so each of the eighty wines must tell an important tale. We head back across Northern Africa to Algeria, once the world's leading wine exporter, before hopping across the sea to Spain and Portugal. We follow Portuguese trade routes to Madeira and then South Africa with a short detour to taste Kenya's most famous Pinot Noir. The route loops around, visiting Bali, Thailand, and India before heading north to China to visit Shangri-La. Shangri-La? Does that even exist? It does, and there is wine there. Then it is off to Australia, with a detour in Tasmania. The stars of the Southern Cross guide us to New Zealand, Chile, and Argentina. We ride a wine train in California and rendezvous with Planet Riesling in Seattle before getting into fast cars for a race across North America, collecting more wine as we go. Pause for lunch in Virginia to honor Thomas Jefferson, then it's time to jet back to London to tally our wines and see what we have learned.